From the award-winning author of Music Through the Floor and Model Home, a riveting and profoundly moving story collection by a writer “uncannily in tune with the heartbreak and absurdity of domestic life” (Los Angeles Times). A boy on the edge of adolescence fears his mother might be a robot; a psychotically depressed woman is entrusted with taking her niece and nephew trick-or-treating; a reluctant dad brings his baby to a debaucherous party; a teenage boy tries to prevent his mother from putting his estranged father’s dogs to sleep. Ranging from a youth arts camp to an aging punk band’s reunion tour, from a dystopian future where parents no longer exist to a ferociously independent bookstore, Last Day on Earth revolves around the endlessly complex, frequently surreal system that is family. 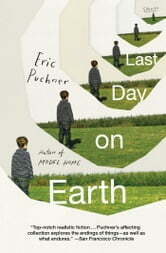 Eric Puchner, hailed as “technically gifted and emotionally insightful” (The New York Times Book Review), and someone who “puts the story back in short story” (San Francisco Chronicle), delivers a gloriously original, utterly memorable collection that evokes both the comedy and tragedy of our lifelong endeavor to come of age. Remember that Nice Lady who Used to Make Homemade Peanut Brittle? She's Dead.